Plans after graduation: Accepted into the Nell Hodgson Woodruff School of Nursing’s Family Nurse Practitioner Program to start in August 2016. 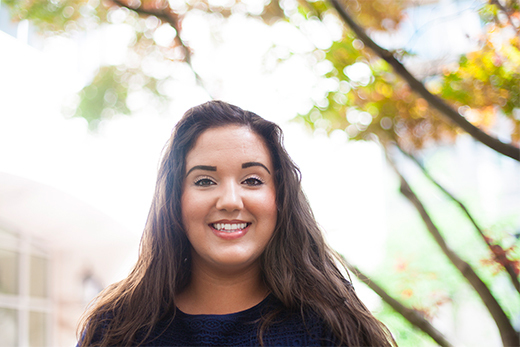 When Haley Reid was accepted into the Nell Hodgson Woodruff School of Nursing, she knew it would be a life-changing experience. As a first-generation graduate, her academic accomplishments were a source of pride for the whole family. But during her two-year journey toward becoming a nurse, she experienced a series of personal tragedies that threatened to derail dreams and would have caused many people to give up. Two weeks after Reid started nursing school, her father unexpectedly passed away. His death caused financial hardships that included the loss of her childhood home. A year later, her mother was diagnosed with cancer through a routine screening. But through it all, Reid — also a 2014 graduate of Emory's Oxford College — kept her focus on her studies, clinical hours and responsibilities as a student ambassador and an Alumni Office intern. She found ways to embrace and balance the new responsibilities of caring for her mom with her own busy life. She used her nursing skills to help her mom through chemotherapy while completing her senior practicum in the emergency department of Saint Joseph’s Hospital at the same time. This year, Reid has a lot to celebrate. She is graduating with honors from the School of Nursing, was accepted into Emory’s Family Nurse Practitioner master's degree program, and her mom is now healthy and cancer-free. Reid discusses nursing school, her plans for the future, and overcoming adversity. Where did you find the strength to persevere through personal tragedy? Quitting just wasn’t an option. My dad really valued education. We are a very middle class family. Neither of my parents went to college or really even finished high school. So for me, going to Emory was a huge deal. I just knew it would not have been acceptable to in my father’s eyes if I had quit or taken any time off. I had such huge goals and aspirations for myself that it just wasn’t an option for me. I had to think of my family and getting an Emory education would give me the means — once I finished my nurse practitioner program — to better help my family. I think having a structure and maintaining a regular schedule was actually very helpful with the grieving process. What was the most rewarding part of nursing school? The most rewarding part of being a nurse is helping people when they are unable to help themselves. It doesn’t always have to be this huge medical miracle. Sometimes it’s just a simple gesture that’s really meaningful to the patient. When I was working on a neurovascular stroke unit, I had a patient who had very limited use of her limbs and asked me if I would wash her hair for her. I knew how difficult and embarrassing it was for the patient to ask me to do this for her. I told her, “absolutely.” We chatted and had girl talk while I washed her hair. After I dried her off and got her comfortable in bed, she looked at me and said, “I will save a place for you in heaven.” To have a patient be so open about how much she appreciated my work is something that was very rewarding to me as a nursing student. After completing my nurse practitioner program, I plan to work in rural and underserved populations. I would love to get on board with the Health Resources and Services Administration. I am in the process of applying to the Nurse Corps scholarship program right now. I really want to strengthen my Spanish background and work in a predominantly Spanish community. I haven’t really decided if I want to stay in family practice because I also have a love for emergency medicine. So my hope is that if I practice in a more rural setting, that I might be able to get a little more emergency/trauma experience as a family nurse practitioner as opposed to here in the city. What is your best advice for incoming freshmen? Trust the process. This is something that I heard in every single one of my orientations, but I don’t think I really understood until now. Emory knows how to mold students. They know how to turn out exceptional leaders and exceptional scholars, something they have been doing for more than 100 years. As a student ambassador, I speak with a lot of undergraduate students and tell them the same thing. I know Emory is very rigorous and expects excellence. Sometimes you feel really pushed to your limits, but trust the process. I think students in orientation are more concerned with how long the program will take and don’t always take in what they are being told. Looking back now, I really wish I had taken the time to synthesize what was being said to me because it is so true.